Any book about Elon Musk stands the chance of being wildly out of date before it hits book store shelves. 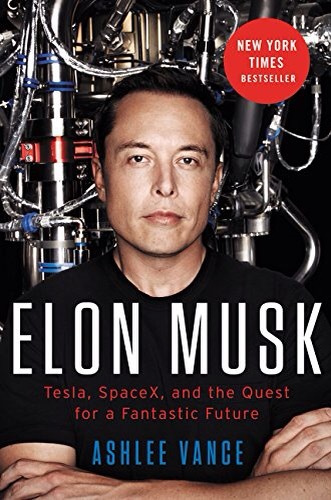 This biography of Musk, by Ashlee Vance, originally published in 2015, already feels a little dated, but it does give a good profile of the man, his companies, and his roots. It is unfortunate then, that while acknowledging Musk’s propensity to be difficult, if not impossible, to work for it does nothing to mitigate the awe that the writer obviously feels for his subject. There is good reason for this. Musk is a larger than life character who if at a press conference announced; “l’m Ironman,” nobody would bat an eye lid. In fact it is hard to know whether the movie version of Tony Stark is based on Elon Musk or if it is the other way round. There is a lack of focus in this book on how appallingly Musk can treat other people. For example, he has been married 3 times, twice to the same woman, and he famously fired his long time assistant, and gate keeper, because she asked to be paid like an executive. What shines through, however, is vision. And that leads to an interesting question for Musk and for businesses in general: Can a dramatic and outsized vision, if you are good enough at selling it, make up for short comings in other areas such as management of people, sound business planning, and realistic expectations? For the moment, Musk seems to be on a roll; however, there are plenty that feel he has built a house of cards and from the stories told of the early days of Tesla are anything to go by, and the economists and manufacturers in Detroit are correct, it certainly could all come tumbling down any day. I also wonder how sustainable a company is when it relies on these most grandiose of goals? What happens when the company cannot achieve these goals? Elon Musk is undoubtably a unique individual, who has remarkable ambitions and achievements; but companies are built on a scalabile culture – not just vision. Mr. Vance’s book does a good job of profiling the vision, but not so much on the foundations and structures for sustainable businesses.